CLEVELAND – The Cleveland Foundation today honored Jim Rokakis, Vice President of the Western Reserve Land Conservancy and Director of Thriving Communities Institute, with its 2016 Homer C. Wadsworth Award. The award is given annually to a local leader who has demonstrated creativity, innovation, risk-taking and good humor in a civic, volunteer, nonprofit or public sector role. Rokakis received the award at the 2016 Cleveland Foundation Annual Meeting presented by KeyBank. Rokakis’ career in public service has spanned 33 years, having served 19 years as a Cleveland City Councilmember and a decade as Cuyahoga County Treasurer before assuming his leadership role at Western Reserve Land Conservancy. Among his many accomplishments, he was instrumental in the passage of a state law allowing for the creation of county land banks. As director of Thriving Communities Institute, he has helped raise more than $327 million for blight removal in Ohio’s communities and more than $2.5 billion nationally through Hardest Hit Fund reallocation. Rokakis has become one of the nation’s leading experts on the foreclosure crisis and neighborhood revitalization. 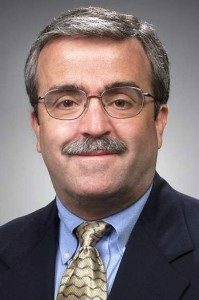 Rokakis has received numerous local, state and national awards, including being named “County Leader of the Year” by American City & County Magazine in 2007. He earned his undergraduate degree at Oberlin College and his Juris Doctorate degree from Cleveland-Marshall College of Law. Homer C. Wadsworth was executive director of the Cleveland Foundation from 1974 to 1983. He was known as a man of creativity, courage, commitment and innovation. Prior to his death in 1994, Wadsworth’s friends and family established the Homer C. Wadsworth Award to identify and honor those in the community who best reflect those qualities. Recent past recipients have included: Vickie Eaton Johnson, who was then director of Fairfax Renaissance Development Corporation; Art Falco, president and CEO of Playhouse Square; Steven Standley, chief administrative officer of University Hospitals of Cleveland; and John Zitzner, president of Friends of Breakthrough Schools.